Scientists and animal husbandry professionals usually have little trouble distinguishing male rattlesnakes from females -- a technique called probing allows them to positively discern a rattlesnake's gender. Unfortunately, this is a "hands-on" technique for pros only. Rattlesnakes are potentially deadly animals who should not be touched, so probing is not an appropriate means of determining gender among rattlesnakes for the everyday nature lover. To probe a rattlesnake, two scientists or handlers are necessary; one person must restrain the snake's head while the other executes the probing procedure. A lubricated stainless steel probe is inserted into the cloaca of a rattlesnake. If the probe penetrates deeply, it indicates a male snake; a probe that penetrates only a short distance is a female. Male rattlesnakes have longer tails than females do. But this is a subjective criterion: It takes considerable experience to distinguish the differences in tail length of rattlesnakes. Male rattlesnakes grow to larger sizes than females do, but this is a valid criterion for judging the gender of mature snakes. 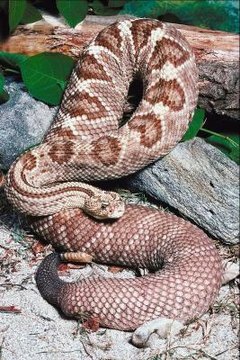 You can determine the gender of two particular rattlesnake species by observing their coloring. Male banded rock rattlesnakes (Crotalus lepidus klauberi) have a green ground color topped with dark crossbars, and females have gray ground color. Prairie rattlesnake males typically have more black rings around their tails than females do, but there is broad overlap in the numbers, limiting its effectiveness as a gender revealer in all but specimens at the extremes of the range.